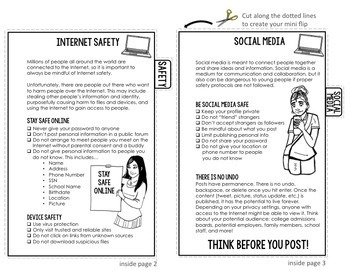 This digital citizenship and Internet safety flip book is designed to help today's students learn about digital citizenship and Internet safety while navigating and communicating online. 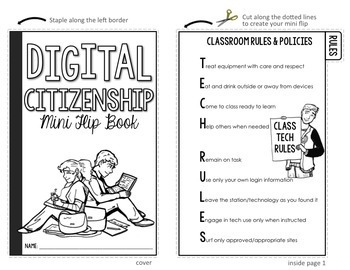 Help your students become mindful digital citizens with this Digital Citizenship Mini Flip Book! 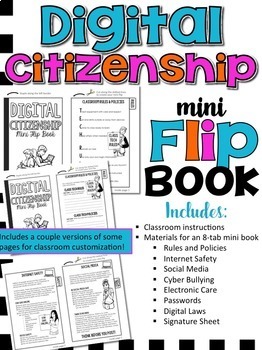 This mini flip book includes 8 digital citizenship tabs: rules and policies, Internet safety, social media, cyber bullying, electronic care, passwords, digital laws, and a student/parent/guardian signature page that turns this mini book into a contract for your classroom. 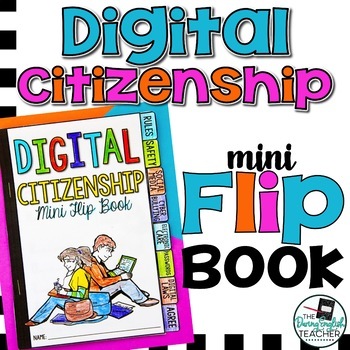 This Digital Citizenship Mini Flip Book includes enough content and options for students to write/check off information to make it an ideal teaching and informational resource. - Compatible with Interactive Notebooks! Teaching in a Digital Classroom? Check out my digital lessons!